The best email marketing and real estate CRM systems include campaign reports that give you insight into the performance of your email marketing. With campaign reports, you’re not forced to market with a blindfold on. You can easily view how many people opened your email, forwarded it, and clicked on hyperlinks within the email. This helps you understand what’s working and resonating with your real estate database and what’s not working. You can experiment with subject lines, calls-to-action (such as, “Pick up the phone and call me now…”), and email subject matter/ content. But campaign reports are useful for one other very key reason. And here’s what a lot of people don’t realize: these reports let you pinpoint potentially hot leads. This is arguably the single biggest reason why they’re so valuable. 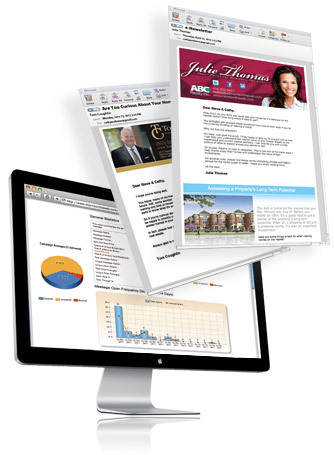 Every time you send out a real estate marketing email, whether it be a Just Listed e-flyer or Just Sold e-card, information about a new condominium development, or a useful homeowner tip, the campaign report will show you who clicked on hyperlinks within your email and who forwarded it on to others. Bingo! These people are likely hot real estate leads that you’ll want to get in touch with right away. It’s also beneficial to look at open rate to get an idea of which emails are performing better than others. Although open rate information is often imperfect due to the many different email technologies available, it’s still valuable for comparison purposes. So now that you know which leads to reach out to right away, a good idea would be to a) give them a call and b) start them on a targeted drip marketing campaign. This campaign should consist of a series of emails designed for their particular lead type. You’ll want to further engage them and/ or incent them in some way. A good real estate CRM will come with pre-designed drip marketing campaigns for different types of leads. This will save you a lot of time as you won’t have to sit down and write out all of the emails as part of the campaign. However, you may want to customize them so they “sound” like you. I recommend a real estate CRM over using an email marketing system alone. The best real estate CRMs can do everything an email marketing solution can do, plus a lot more. Listing and closing Activity Plans, website lead capture, transaction management, and the ability to create letters and labels are just some of what I’m referring to. And you likely won’t have to pay a whole lot more money (if any more at all) for a CRM. Campaign reports can play a big role in helping you target hot leads in your real estate database and ultimately increase the return on investment (ROI) of your email marketing. Email can be a tremendously impactful tool to keep in touch and stay “top of mind” with your contacts, but you need to practice “smart” email marketing in order to maximize your success.